Thank you for your interest in the Stipplr Photoshop plugin! The Stipplr plugin offers all the Actions available on this site through an easy to use interface within the Photoshop environment. Whenever a new Action is released it will automatically appear in the panel with with all the other Actions. Each Action is displayed as a final render making it much easier to visually identify the graphic effect you are trying to achieve. Additionally, we’ve added search filters so you can sort the Actions by category or by using a search filed to sort by keyword — no more jumping betweent Photoshop and the website to find which Stipplr Trace Action you want to render! 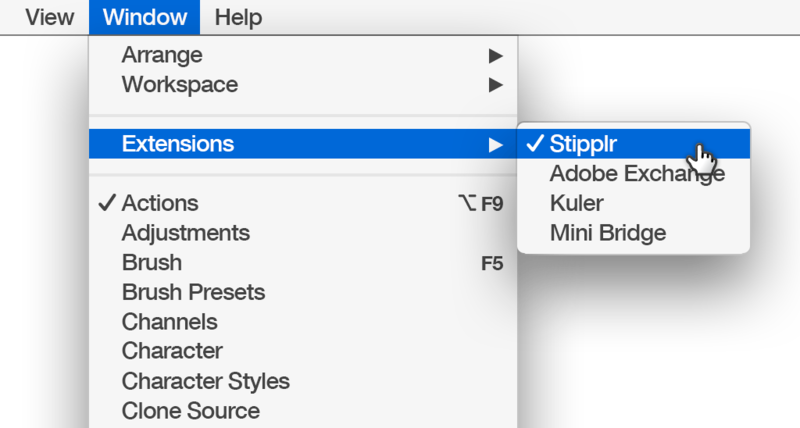 Continue reading for instructions to help you download our Photoshop plugin installer and for a very brief overview of the features found within the Stipplr panel. The following tutorial is for anyone who has recently downloaded the Stipplr panel and needs help installing the panel, creating an account and logging in to access the free trial or metered mode. After reading through this tutorial you may want to check out our extended tutorial on how the panel works — it will walk you through the process of searching, caching, bookmarking and generating your favorite shape actions. To avoid problems during installation, please download the installer for your version of Photoshop. Creative Cloud users will be directed to Adobe’s Add-ons website where it will be installed for you — see installation wizard below for a smooth experience! If you have not downloaded the Stipplr extension for Photoshop yet you can do that using the button below. Once your download begins you will be directed to an installation wizard that will walk you through the installation process. Once Photoshop has been launched, go to the Window menu and hover over the Extensions menu item to reveal the sub-menu popout. From this popout, select Stipplr. Whenever the panel is opened from a closed state, it will open on the Actions list page and present you with a subset of Trace Actions which can be rendered without having to log in. Enter your name and email address into the fields which appear. The panel will notify you immediately that it has created your new account and that a confirmation email has been sent to the address you provided. Enter the temporary password found in your invitation email. You are now logged in and ready to create Adobe Shapes with Stipplr’s preset Trace Actions! Whenever you Sign In successfully the panel will go to the profile panel — accessing the profile panel manually is highlighted by the cursor in the image below. To get to the Action list simply click the Action icon located at the top of the panel (shown below at the top of the panel). The Actions are paginated in lists of 35 items to keep things manageable, use the navigation at the bottom of the panel to jump between pages just as you would on the website. Navigating between pages will feel slow the first time around as the panel caches the thumbnails locally — as you continue to view the Action list and each Action details page the speed will become near instant. Finding content is done a few ways, you can use the search field which will instantly start filtering for your phrase and update the list. Alternatively, you can filter by entire categories by using the Category menu to the left of the search field. Once the Action list is filtered to view all trace actions in a specific category you can use the search field which will only filter results from that category. The Details page was made to resemble a miniturized version of the stipplr.com website Details page (the page you normally download the Action from). The difference between the Details page on our website and the Details page in the plugin is that you can run the Actions directly from the Details page (manually installing the Actions is now a thing of the past). To access a Detail page we must find an Action in which we are interested from the Action List panel. In the case of the screenshot below, we can be seen hovering our mouse over the BENDAY011 Action preview within the Action List. To view the Details page for the BENDAY011 Action simply click on the highlighted row. Clicking the row immediately slides the Details page for the BENDAY011 shape tracing action into view. 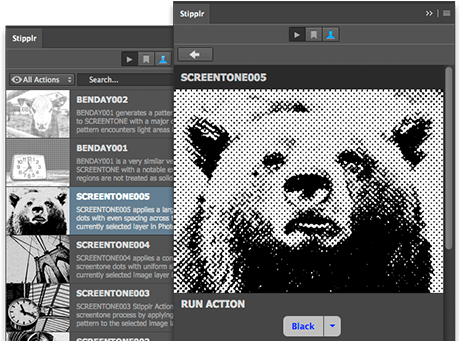 The title, large image preview, text description, specs and social sharing are all features found when viewing any trace action on stipplr.com website with one notable difference — a large button titled with the name of the Action. The Stipplr plugin allows you to add your favorite tracing actions to the Bookmarks panel. Each product Detail page has a link to add the current action to your Bookmarks panel. Add To Bookmarks (below) adds the action to the bookmarks list. To view your Bookmarks, click on the Bookmark icon at the top of the panel (see below). The Bookmarks panel works exactly the same way as the Actions list panel. The category menu, search field filtering and pagination (if enough content is bookmarked) all work the same way but are limited to searching and filtering tracing actions found in your bookmarks list. All support, contact and bug reports are filed through the stipplr.com website, therefore selecting options from this menu will switch you over to your browser. The order in which this menu is presented is not yet finalized, items may shift. The Enable logging option is for submitting bugs. When you discover a problem you can Enable logging which will create a plain text file on your desktop called stipplr.log — this file will contain a transcript of what the panel is doing and allow us to understand what failed if you choose to send it to us. Need more help? We recommend reading our tutorial on how to use the Stipplr panel which contains more in-depth information.